Early channel of trade, its valley long an area of plantations. Frequent floods until 1952; since controlled by Kerr Dam. Old name was "Moratuck." Beginning in Montgomery County, Virginia, at the junction of North and South Fork, the Roanoke River enters North Carolina in Warren County and flows through Halifax, Northampton, Bertie, Martin, Washington Counties, before emptying into Batchelor’s Bay of Albemarle Sound. The Roanoke River is one of the five largest rivers in the Southeast that flows from the foothills of the Appalachian into the Atlantic. For North Carolina’s earliest settlers it was a channel of trade. 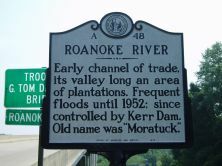 Settlers were attracted to the Roanoke River Valley because of the fertile soil. Along the river in Halifax County, the Coastal Plain and the Piedmont Region meet in a fall line, creating rapids and waterfalls on the Roanoke River. 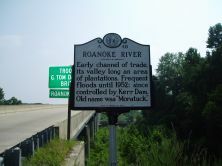 In August of 1940 a record flood devastated the Roanoke River Basin. Crops, homes, and industries were destroyed. Citizens organized to voice their concerns and express the need for flood control measures. The Roanoke River Basin Association was formed in 1945 by leading citizens of both Virginia and North Carolina to promote construction of Kerr Dam and other dams including the Gaston and the Smith Mountain Dams. Kerr Dam, completed in 1953, is the largest dam in the Roanoke Basin system.